Here's a great healthy, wholesome breakfast idea! Sometimes eating a healthy breakfast can be a challenge. All too often we are on-the-go, ready to hit the road. But when you have the time, isn't it nice to sit and enjoy a nice breakfast? This recipe is simple yet deliciously healthy. Quinoa is one of the most complete food sources and is very good for you. Add some fresh blueberries and coconut milk and you have a breakfast treat that may just make you want to stay home and eat some more! 1. Soak the quinoa for a few minutes in a measuring cup and rinse carefully through a fine sieve. (If you don’t soak the quinoa, it will have a bitter taste). 2. 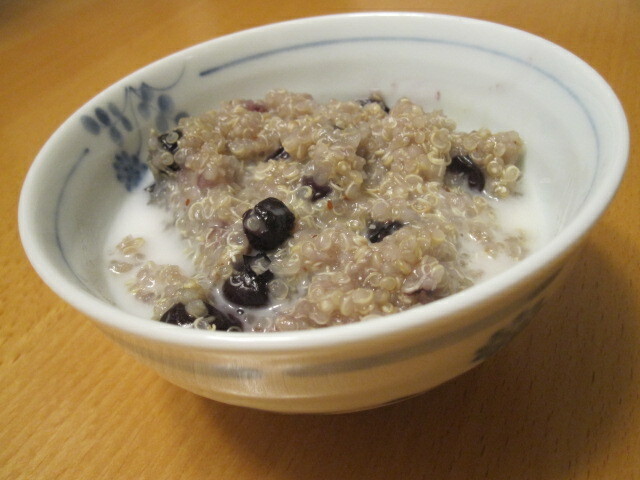 Place the quinoa in a pot and add 1 cup of cold water and the blueberries. If you have kombu, add a postage-stamp sized square. (You’ll remove it before serving, but it adds trace minerals). 3. Cover the pot and bring to a boil. Once the quinoa comes to a boil, turn down to simmer and cook for another 20 minutes, stirring occasionally. As some of the blueberries disintegrate, the quinoa will turn a slightly purplish color. 4. You’ll know the quinoa is completely cooked when the quinoa spheres open into spirals. Serve the blueberry quinoa in bowls. Stir in maple syrup to taste and top with coconut milk to taste.